Straight off the Machinist assembly line! 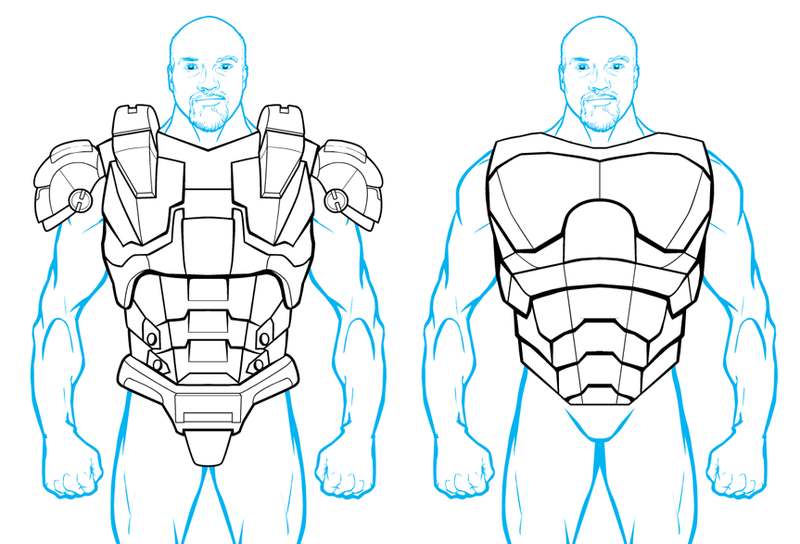 Add these tech armor pieces to your arsenal and complete your machine of war! The two torso pieces can be found in Tops/MaleTech. The two shoulder pieces (shoulder pad armor and weapon mount) can be found in ShoulderRight/Tech and ShoulderLeft/Tech. The metal codpiece can be found in Legwear/MaleBriefs. Nice, I see potential for more uses than armor. How’s this for a suggestion? Release new items on Mondays as part of the Character Design Challenge or Saturdays as a Pop Quiz. For the moment I plan on providing images through a weekly poll, starting in December. The poll will come out one day and then a week later the winning item will be announced and a new poll posted. I’m hoping to be timely on the creation of the items so I can then post a new item(s) every week. I’m not sure what day the poll will be put up but I will try to coordinate it with the other blog posters. The same will be true for the announcement of new items (emphasis on “announcement”, the new items may already go live for awhile before I post an official heads up). This is less of a suggestion for a big epic piece and more a whiny drone, but personally, I’d like to see some fingerless gloves without the patch on the back of the hand. Debochira, I haven’t tried it, but can’t you fix the problem by making both parts the same color? If he did that, the gloves would no longer be fingerless like he wanted. This sounds like an easy request. If you can please post this to my forum thread “dblade’s Whiz Bang Item Dispenser”. This will allow me find the the request more easily in the future. I’d like to see Female Tech options, if that’s possible.